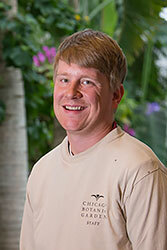 Chester Jankowski, Jr., is the assistant horticulturist for the Grunsfeld Children’s Growing Garden and the Kleinman Family Cove at the Chicago Botanic Garden. He is responsible for designing and maintaining the gardens, and working with the education staff to make all the annual displays at the Children’s Growing Garden accessible to everyone. At the Cove, Jankowski uses the garden to create an outdoor classroom filled with nature for children to observe and study. He also rotates on weekend duty to water gardens during the growing season, and to indoor displays for Wonderland Express and the Orchid Show during the winter seasons. Jankowski started working at the Garden in 2015 as a Windy City Harvest intern. He interned at the Regenstein Fruit & Vegetable Garden for one summer before being hired as a seasonal employee. In 2016, he was hired as the assistant horticulturalist for the Entrance Gardens, and in 2017 he was promoted to the Grunsfeld Growing Garden and Kleinman Family Cove. Jankowski has completed the nine-month Windy City Harvest Apprenticeship program and has certificates in sustainable urban agriculture and horticulture. He previously worked at the Chicago Zoological Society and with a handful of landscaping companies, helping to design and maintain new gardens.